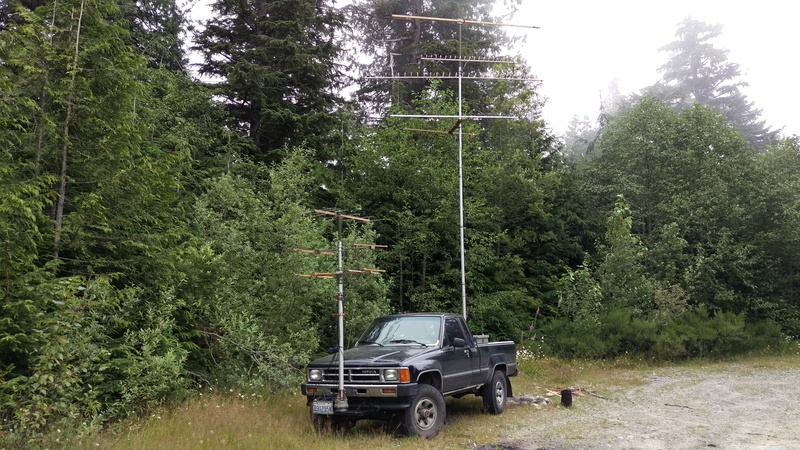 This year’s August UHF contest was not sponsored by the ARRL for the first time. Nevertheless, activity was not too bad in Western Washington. 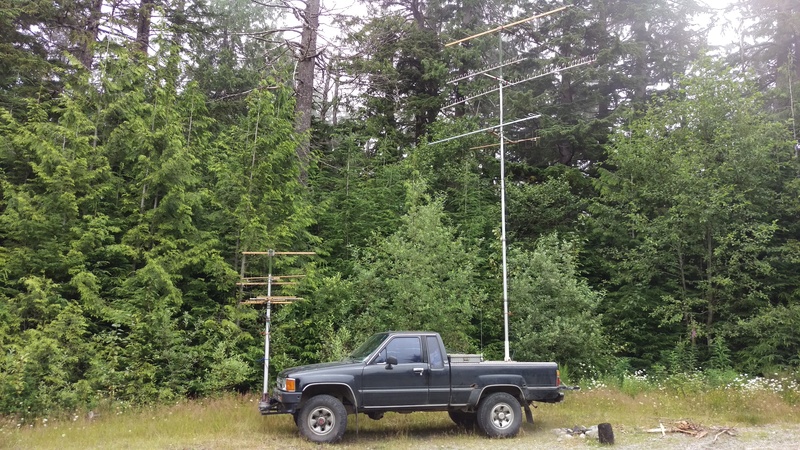 I participated as a Limited Rover on all four permitted bands: 222 MHz, 432 MHz, 902 MHz and 1296 MHz. My roving took me around Western Washington from North of Lake Stevens down to Kalama along the Columbia River. Contest preparation began weeks prior to the start, with a flurry of maintenance on my 1988 Toyota pickup truck after finding an area of corroded components on top of the fuel tank. I replaced two corroded brake lines and the metal fuel lines coming out of the fuel tank, as well as the fuel tank and fuel pump. While I was at it, I replaced a leaking water pump and all hoses, a weak battery, and a problematic alternator. I only had about 15 minutes of driving on the truck before the contest. Fortunately, it ran like a top for the contest. The other preparation was getting my 1296 MHz transverter/amplifier assembly functioning again. I had used it on a number of SOTA activations and that broke something. Among other things, the very old DEM discrete-component 18 watt amplifier needed to be tuned up to present a reasonable SWR to the SG Lab transverter. The equipment was slightly upgraded and reorganized from last year’s effort. Here is the main equipment rack secured to the passenger seat (click on photos for a full-size image). On top of the rack is a box containing a 1296 MHz SG Lab transverter housed with an old DEM amp and a Homebrew TR switch/sequencer/IF switch. I described this in more detail here. Below that is the SSB Electronic LT-33S 903 MHz transverter. The output is fed to the amp described below. Below that is a pair of Yaesu FT-857D for 432 MHz (the heads are mounted remotely). 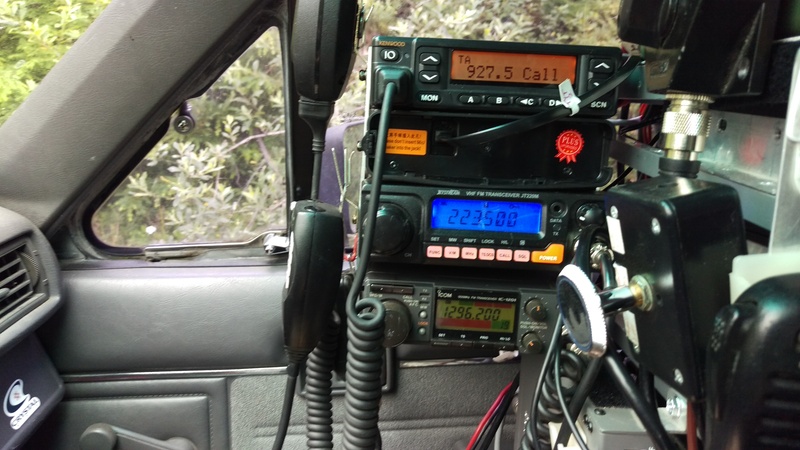 One serves as a IF radio for 1296 MHz and 902 MHz transverters. The other is the primary 432 MHz weak signal rig. Below that is a Mirage amplifier for 223.5 MHz. Below that is a TE Systems amplifier for 222.1 MHz. Below that is an RF Concepts amplifier for 432 MHz. Below that is a Kenwood TS-480SAT used as an IF rig for 222 MHz. Below that is a 50w 903 MHz amplifier assembly, including the coax attenuator. I described this in more detail here. 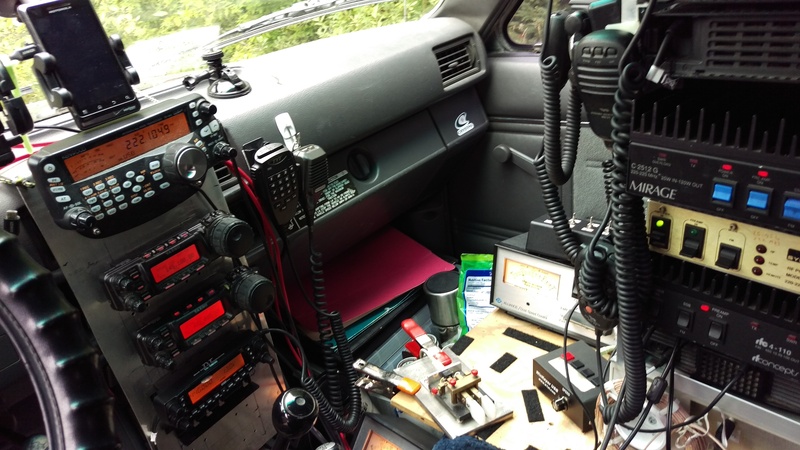 On the upper left is the FM radio sub-rack described below. Mounted sideways on the lower left is an Elecraft XV222 222 MHz transverter. Behind the passenger seat can be seen a TGE power booster affixed to the top of a battery box with a second battery. A couple of speakers, connected to the Yaesus, can be seen affixed to the rear wall. On top is a Kenwood TK-981 (12w, 927.5 MHz nbFM). Below that is a TYT TH-9800 for 440 MHz FM. Below that, with the blue display, is a Jetstream JT220M (223.5 MHz FM). Below that is an Icom IC-1201 (10w, 1296.2 MHz FM or 1294 MHz FM). Four remote heads are mounted on a movable panel over the front console. Two rotors control boxes can be seen for the Alliance HD-73 rotors that turn the front and rear antenna stacks. Atop the upper rotor control box is a switch box for the homebrew remote antenna switching relays. 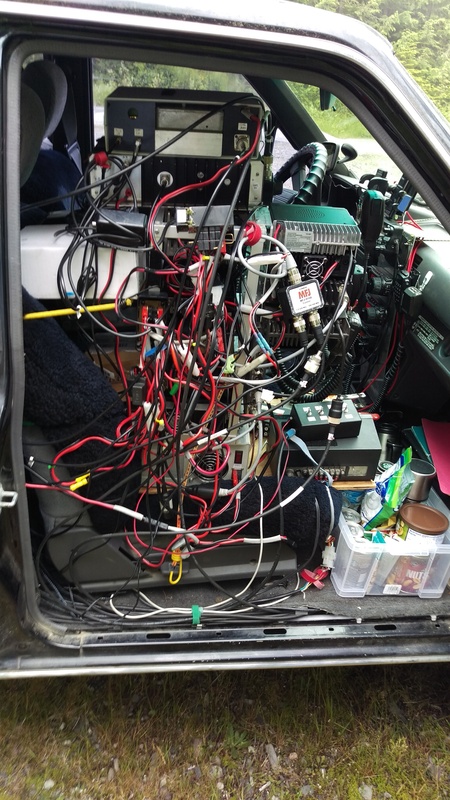 For 222 MHz the two antennas are switched between the two rigs/amps. Three other switches are SPDT relays to switch 432 MHz, 903 MHz, and 1296 MHz between the front and rear antennas. Next to the paddle is a K1EL Winkeyer used for CW. 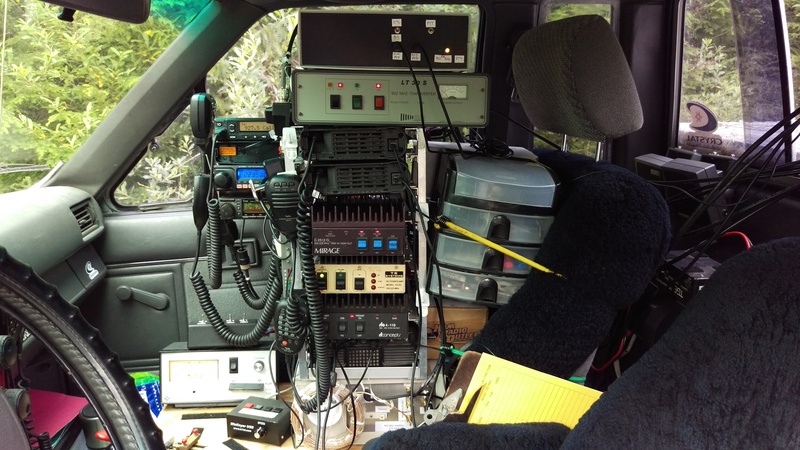 On top of the dash is one of two cell phones used to display maidenhead grid and/or UTC time/date. The who thing is connected together with a rat’s nest of wires and coax. The antennas are pretty much identical to what I had last year. Basically there are two antenna stacks, front and rear. The seven front antennas are used and rotated while in motion. In Washington state, front overhang must be within 3′ of the front bumper. The rear antenna stack collapses while in motion, and the mast is extended only while stationary. It takes about 8 minutes to deploy the stack and 5 minutes to secure the stack for transport. The font stack sits at 8′ to 10′ while in motion, but can be (but wasn’t) extended to 25′. 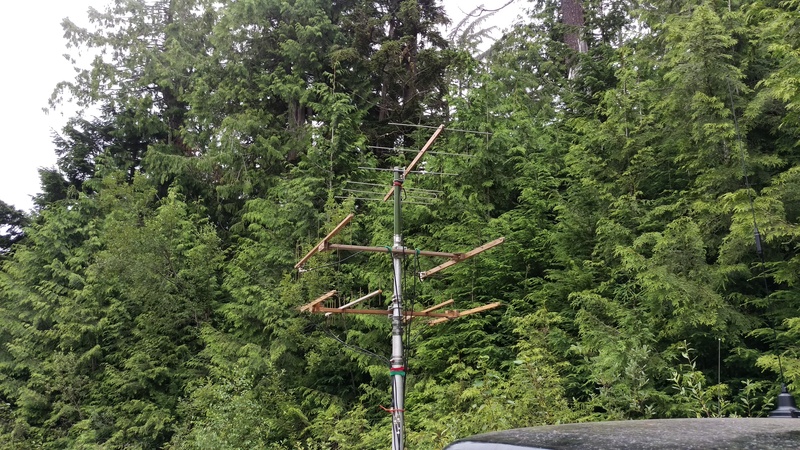 Top: 6 element 222 MHz WA5VJB “cheap” yagi. Middle left: 8 element 440 MHz vertically polarized “cheap” yagi. Middle Right: 8 element 432 MHz horizontally polarized “cheap” yagi. Bottom cross-boom left: 10 element 1296 MHz horizontally polarized yagi. Bottom cross-boom centerleft: 10 element 927 MHz vertically polarized yagi. Bottom cross-boom center right: 10 element 1294 MHz vertically polarized yagi. Bottom cross-boom right: 10 element 903 MHz horizontally polarized yagi. 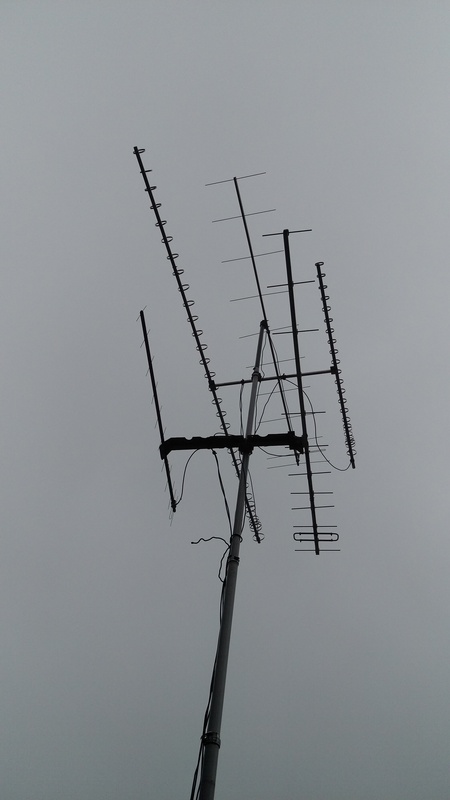 Top: 11 element 222 MHz “cheap yagi”. Middle left: 33 element 903 MHz loop yagi. Middle right: 24 element 1296 MHz loop yagi. Bottom left: 11 element vertically polarized 440 MHz “cheap yagi”. Bottom right: 12 element 432 MHz LFA yagi. The route was from north in CN98 down to the CN85/CN86 line and included seven grids. Route from A to B with other stops near the white circles. Preparations for the contest were a bit rushed for this one, but I pretty much finished everything on Friday evening. Saturday morning was more relaxed, and I got off to a good early start for the two hour drive to Mt. Pilchuck. I arrived with plenty of time to set up antennas and double check the equipment. At 11:00am local time, it began. Things were off to a slow start from CN98 with about a dozen QSOs each on 432 MHz and 222 MHz. I only managed two 900 MHz QSOs and three 1296 MHz QSOs. Past contests have produced greater QSO counts from this location, perhaps reflecting reduced participation this year. The CN88 location, at only 400′ MSL at a school in Lake Stevens, is never very productive. This year wasn’t too bad with seven and eight QSOs on 222 MHz and 432 MHz, respectively. 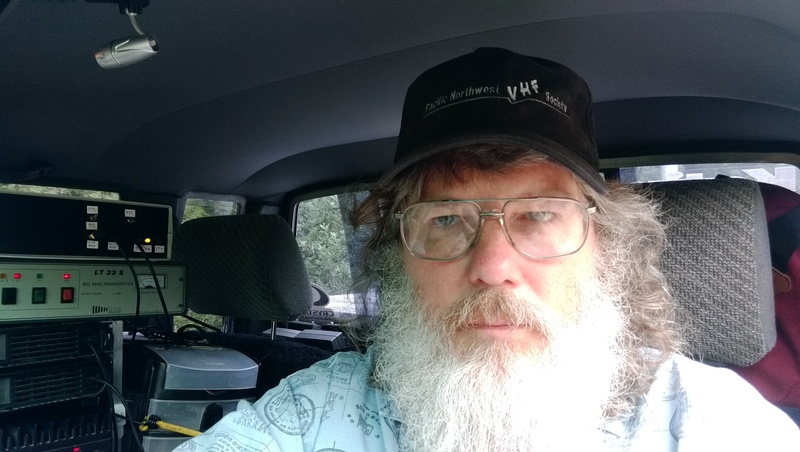 I was pleased to make a pair of QSOs on 1296 MHz and one on 903 MHz. After leaving CN88, I had an hour trip through CN87 to my next stop. This produced eight QSOs, including 1296 MHz and 903 MHz QSOs with Ray, W7GLF. The stop in Central Park in Issaquah included both CN87 and CN97. The grid line goes through a long parking lot with rotaries at each end, and enough room to move the required 100m. This location was remarkably productive at only 750′ MSL. It is positioned so that signals to the south can shoot between Tiger Mountain and Squawk Mountain and hit population centers to the south. 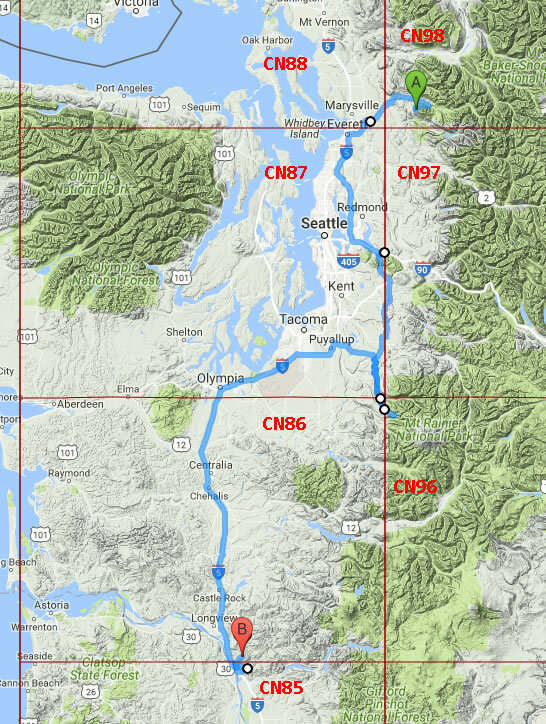 Population areas to the southwest (Tacoma) can be hit between Squawk and Cougar Mountains. The location is unobstructed to population areas to the west (e.g. Seattle) and north. I overstayed my stay there by an hour because it was so productive and easy to move between CN87 and CN97. In the end, I made about 45 QSOs, including seven 900 MHz QSOs and nine 1296 MHz QSOs. I made up for lost time by re-arraigning the rest of the evening. I would skip the CN87 stop in Carbonado (which isn’t very good for UHF+, in any case), and stopping first in CN86 before hitting CN96. En route to CN86 took me through both CN87 and CN97, which yielded a half dozen more QSOs. I arrived in CN86 at about 7:50pm and got down to business. The CN86/CN96 locations allow me to point antennas directly Mt. Rainier that filled the view in my windshield, and sitting at 3,000′ or above, I have good line of sight to some population centers. The results show it. After two and a half hours of working CN86 and CN96, I had 53 QSOs, including six on 900 MHz and 11 on 1296 MHz—mostly off of Mt. Rainier. I stayed to about 12:30am, way beyond my schedule, to work a couple of friends who showed up late. This was followed by a two hour drive south in I-5 to a rest area near Kelso, Washington. I made no QSOs during that trip. In the rest area, I leaned the seat back and caught a few hours of sleep. Sunday morning, brought me to the foothills above Kalama, WA on either side of the CN85/CN86 grid line. I started out in CN85 in the yard of a buddy who lives near the high-spot of Green Mountain Road. This location is line-of-sight into Vancouver, WA and Portland, OR to the south, and provides a fair path back to Puget Sound populations. The 2.5 hours in this location produced 24 QSOs, including three QSOs on 1296 MHz with K7YO in CN86 and K7ATN & KE7MSU/R in CN85. In some past UHF contests I worked nobody in CN85 on either microwave frequency. Attempts on 927.5 with these stations failed. The next stop was 5 miles to the north in CN86. I spent less time here because I had worked many Puget Sound area stations from CN86 the evening before. I managed to work the same three folks on 1296 MHz. The big surprise was working KB7W in Bend, OR, CN93 on 432.1 MHz CW with three minutes remaining. We QSYed to 222.1 MHz after that to no avail. Still, a new multiplier was a terrific way to end the contest! The final (preliminary) score is (17 grids worked + 7 grids activated) * 723 points = 17,352. Participation in the Pacific Northwest was definitely a little down this year. It may reflect the ARRL’s non-sponsorship, or it may just be that many people were on vacation. Regardless, the people participating were certainly enthusiastic. It was an excellent contesting experience.